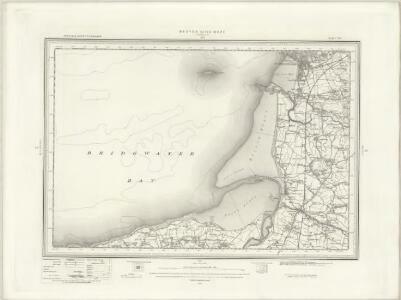 This drawing covers the area around the mouth of the River Severn, showing sandbanks and the confluence of the River Yeo. Much of the surrounding land is flat with field boundaries marked clearly on the plan. Around Bleadon Hill, red lines descripe fields with stone walls. To the right of Newton, a castle is marked by a white circle. The drawing is covered by three-inch squares used for copying and reduction.